The expansive outdoor living area serves as an extension of the home's interior. A stone retaining wall supports the terraced patio and free-flowing radius walls define its borders. 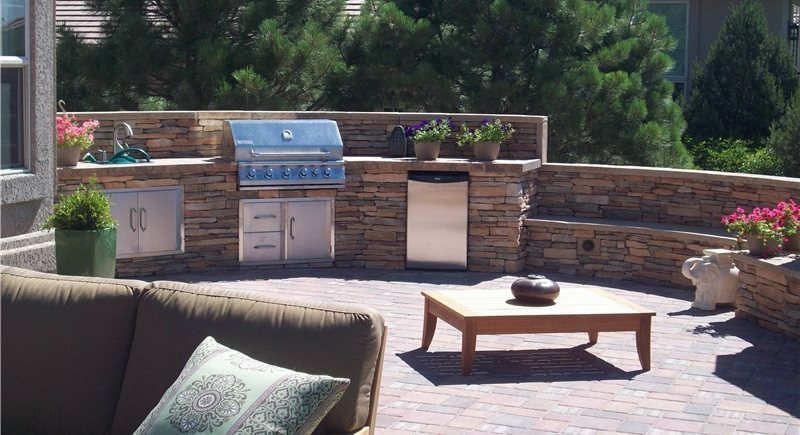 The patio's side entry features stone veneer walls and decorative columns. A gas fueled fireplace was integrated into the radius walls. The cooking station is sunken below the rest of the patio. 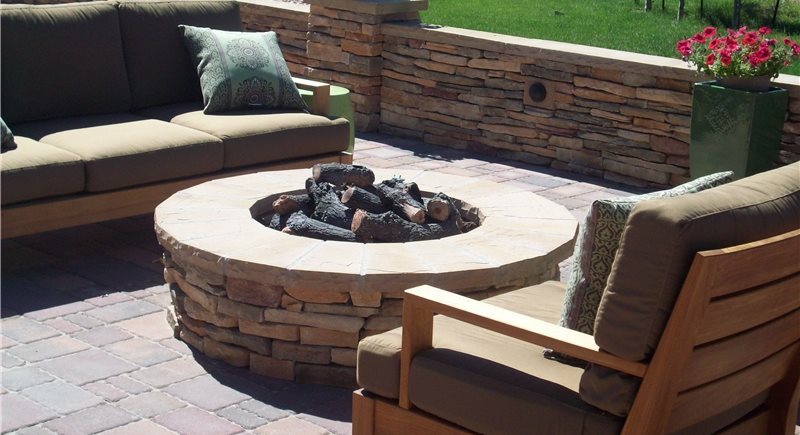 A custom-built gas fire pit keeps family and friends warm on chilly evenings. 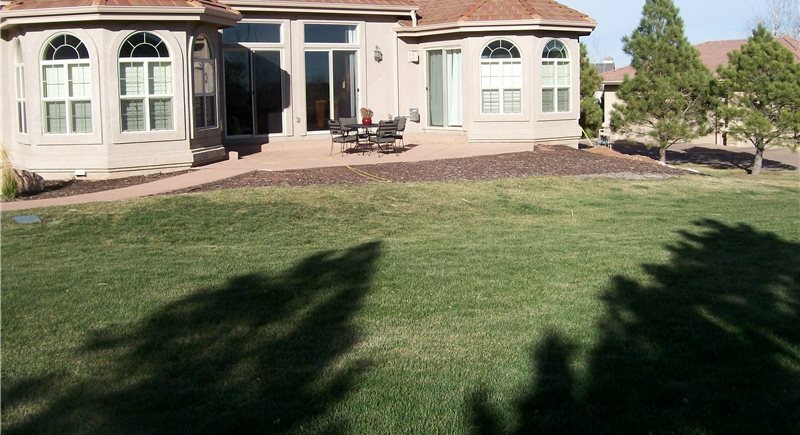 A before shot of the backyard and small patio. 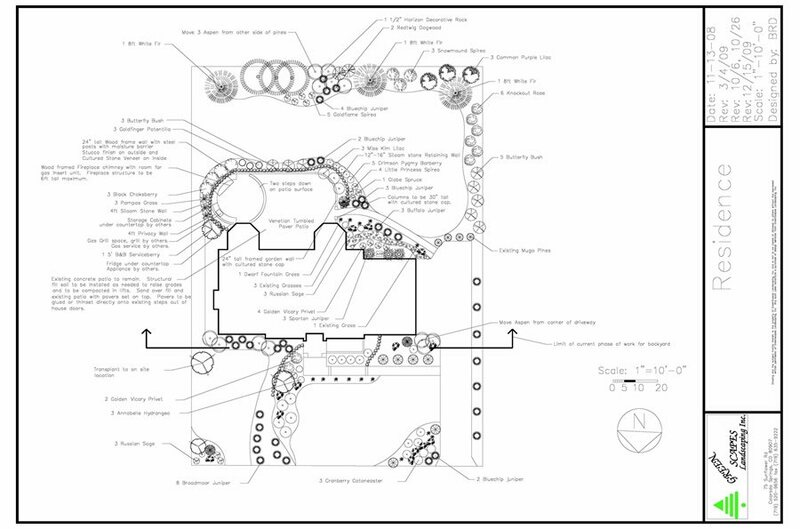 The design plan for the project. 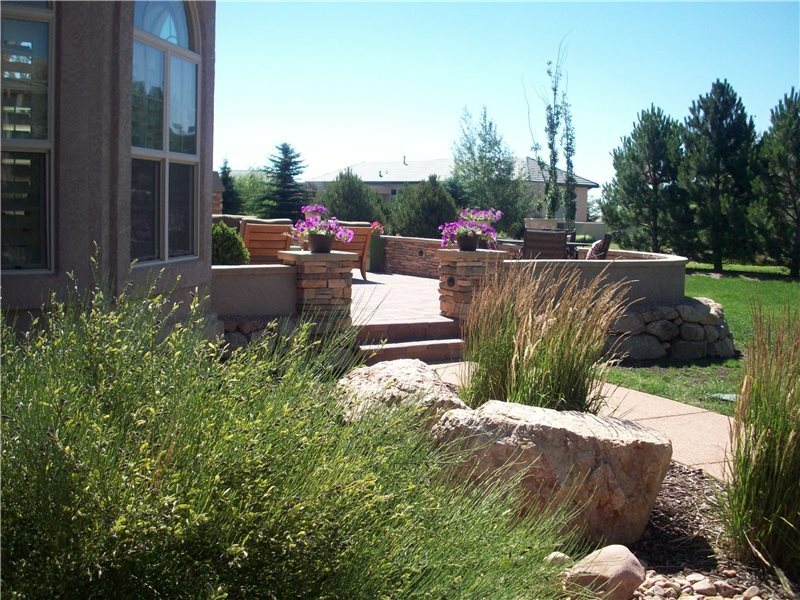 Landscape Contractor: Green Scapes Landscaping Inc.
From the indoors, the main focal point of this upscale Colorado Springs home has become the outdoors, thanks to a terraced landscape design and a panoramic view through broad expanses of glass. The backyard patio, intended for entertaining and to create a visual extension of the home, draws the eye outdoors as soon you walk into the front entryway. 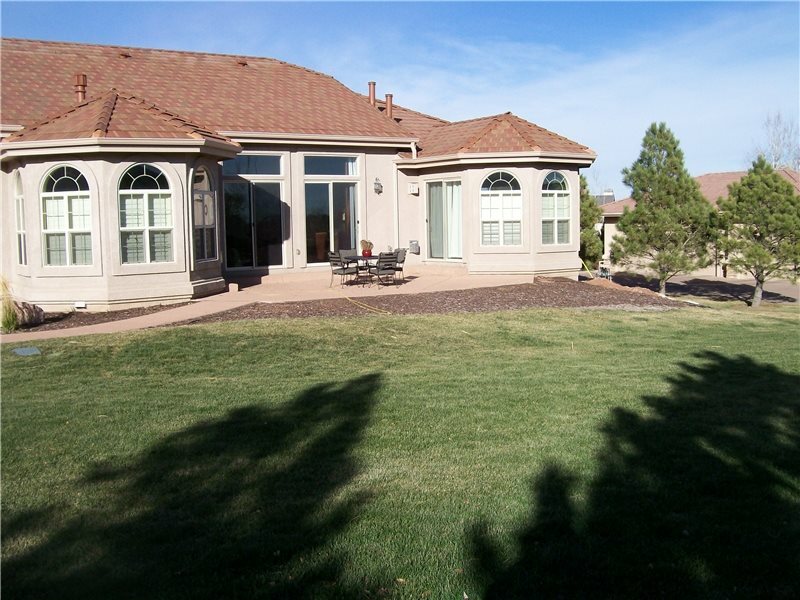 To soften the 45-degree angles and perpendicular lines of the home, the landscape design has no straight lines. 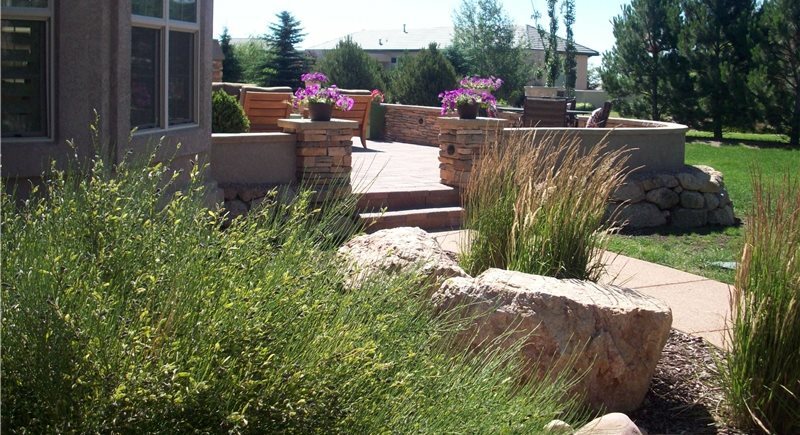 "I think the most exciting thing about this project are the meandering radius privacy walls and the curved step to the lower kitchen/fireplace area," says designer John Winn of Green Scapes Landscaping, Colorado Springs. "This allows for a free-flowing design that breathes elegance and a custom style." 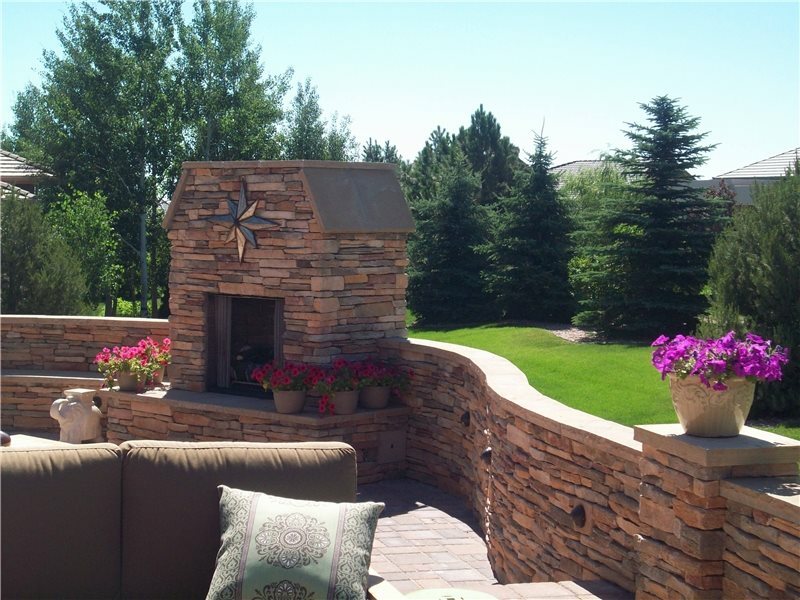 The privacy walls are faced with cultured stone and the column caps are made from custom-cut natural stone. Design Tip: Plan ahead for exterior lighting. During framing of the privacy wall, Winn pre-wired it to accommodate 12-volt half-moon light fixtures (from Kichler Lighting). Winn suggests using local materials to save money. 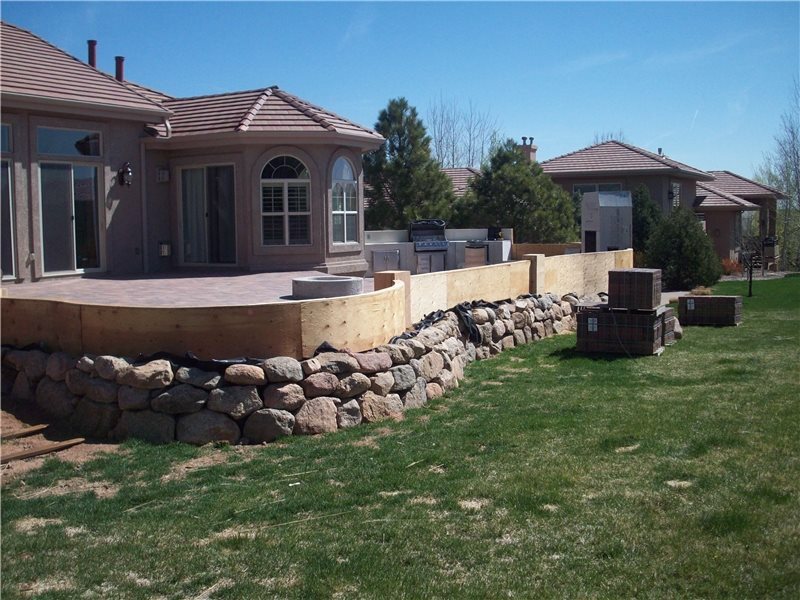 The stone retaining wall surrounding the patio was built with Broadmoor granite boulders, which are native to Colorado Springs and have warm, earthy color tones ranging from beige to light coral. 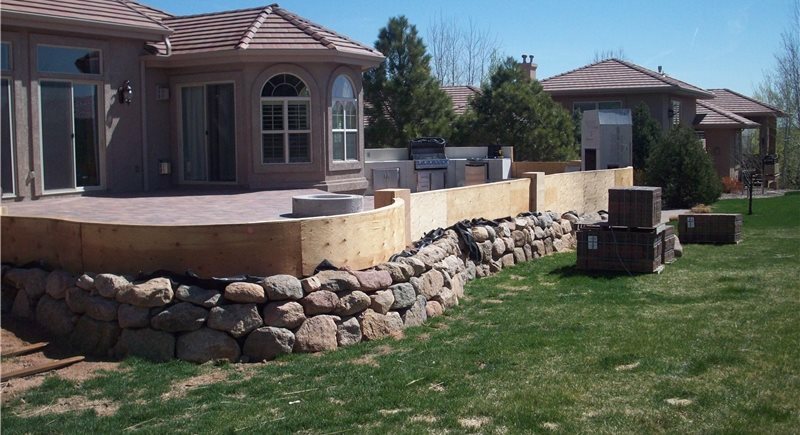 Retaining walls were needed to support the newly graded patio area. Green Scapes raised the grade of the backyard to create a single step down from the door threshold to the patio surface. 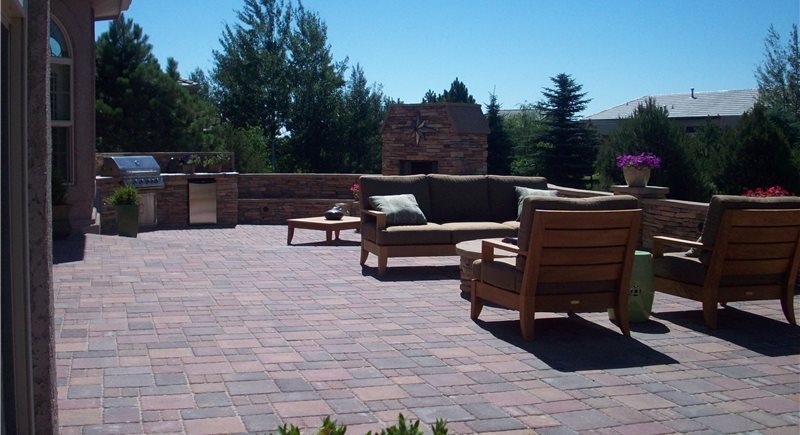 The expansive patio features tumbled cobble pavers from Borgert Products in an autumn color blend that complements the walls. The fireplace and food prep area can be seen in the background. 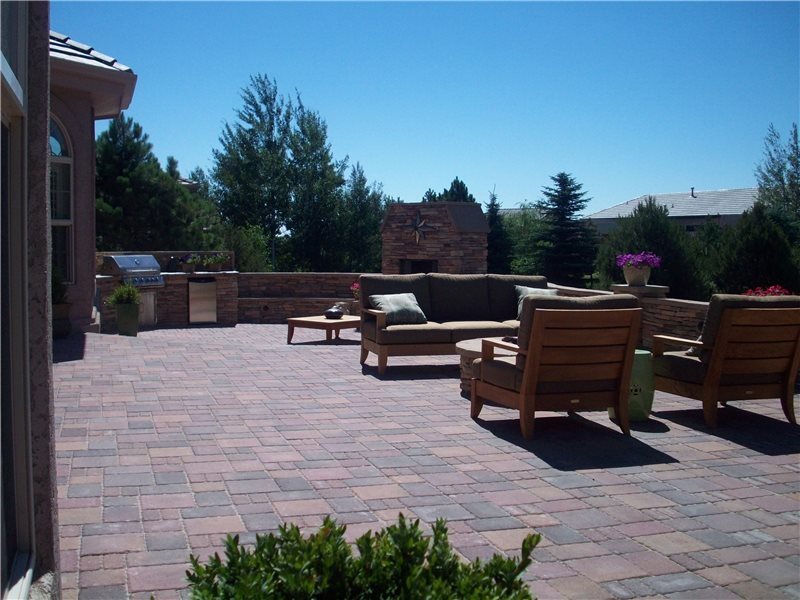 Winn likes to expand the size of outdoor living areas with paver patios, cooking stations and large entertaining areas, in order to reduce the size of turf areas and conserve water. The food preparation area has a porcelain countertop with a built-in stainless steel gas grill from Jenn-Air, a stainless sink and faucet, and stainless steel cabinet doors. 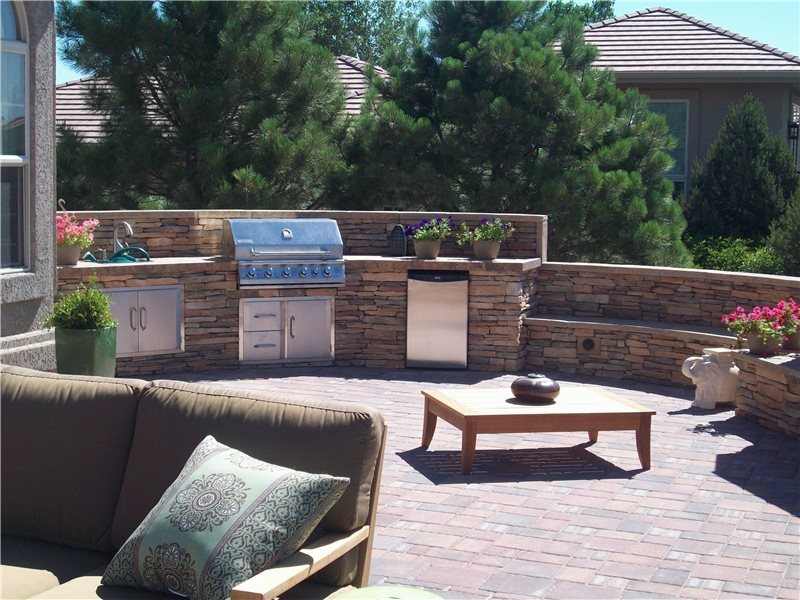 It's adjacent to the fireplace so guests can relax nearby while someone is cooking on the grill. Design Tip: Create zones for different activities. On this project, the kitchen/fireplace area is located on a separate lower patio, with a curved step leading down to it. 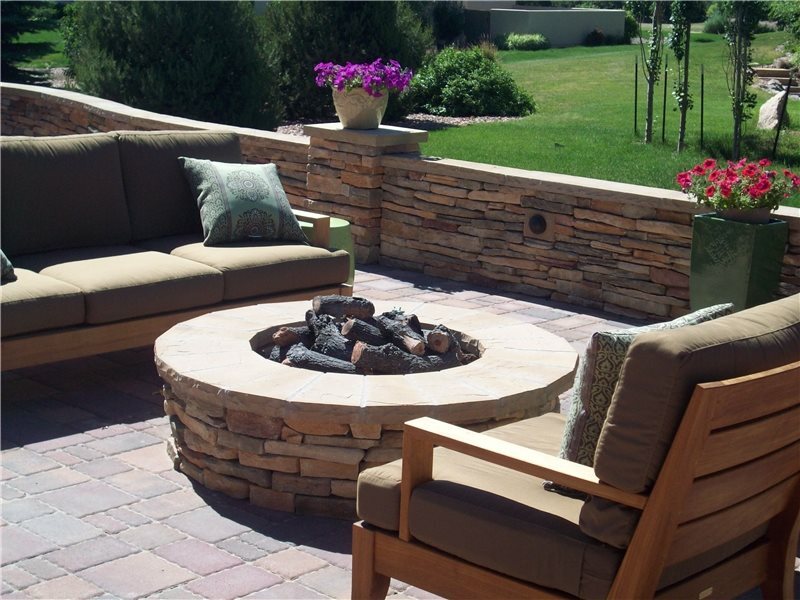 The circular fire pit, capped with cultured stone, permits outdoor entertaining on chilly evenings. It delivers 60,000 BTU of heat, provided by a nine-piece gas log set with a remote control (from Warming Trends). 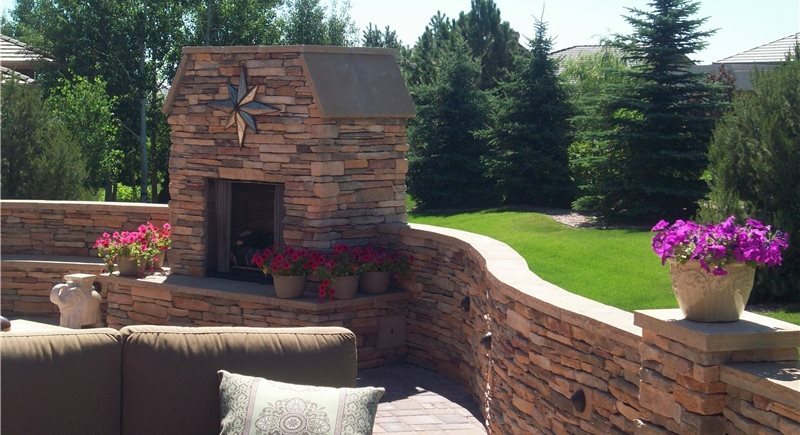 The fireplace, which is integrated into the curved privacy wall and clad with a rustic stone veneer from Eldorado Stone, creates a warm gathering spot for conversation. The fireplace was strategically located to screen out the view of a neighboring home and provide a vantage point from inside the house. On projects with multiple elements heated by natural gas (such as an outdoor grill, fireplace and fire pit), Winn stresses the importance of predetermining the right size and length of piping that will be needed to efficiently fuel all areas. 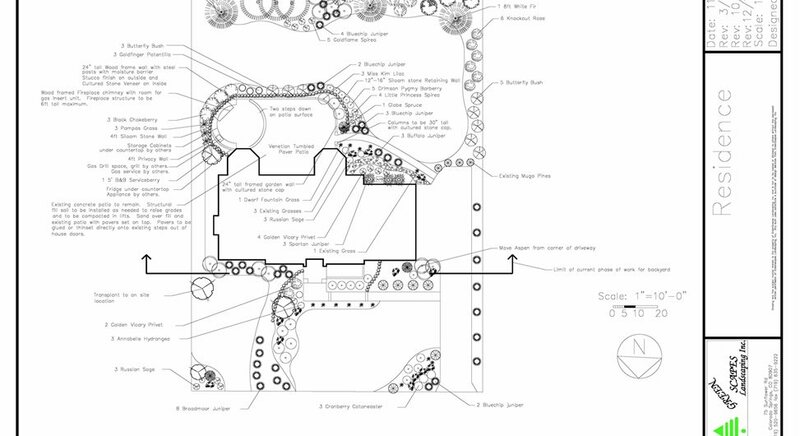 View a PDF of the plan for this project.